Guild members Nic Bridges and Janine Matthews were born on opposite coasts of Australia, worlds apart. Their paths would never have crossed if not for a common love of art and textiles. Since meeting through an internet group a dozen years ago they have been partners in crime, joined at the hip, like-minded souls traveling through life with eyes wide open but utterly different points of view. 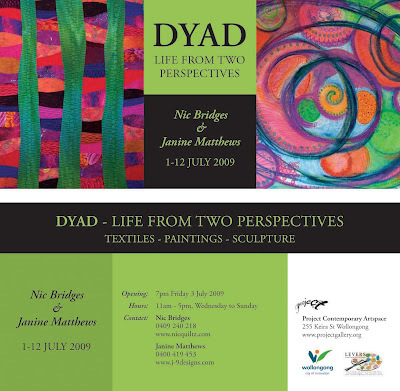 In their forthcoming exhibition of textiles, painting and sculptures at the Project Contemporary Artspace in Wollongong from 1-12 July, Nic and Janine explore the concept of Dyad, the principle of twoness in their separate artistic practice as well as in collaboration. This is a must see, it will be a nice day trip for us.